Pisa is a legendary city and one of the most famous in this region of Italy. Tourists often stop at Pisa en-route to Florence but it is a fantastic city to stay in and offers a great deal more sites than just it’s legendary leaning tower. 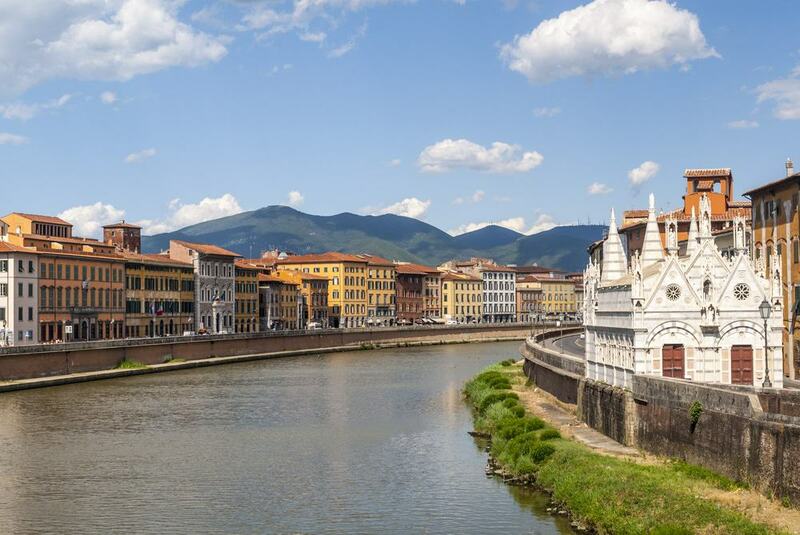 Located on the western coast of Italy, Pisa is only 20 minutes from the Ligurian Sea and has great transport links to Florence, Livorno and La Spezia. With a population of just 91,000 it is one of the smaller cities in the Tuscany region of Italy, but has historically been one of the most important and influential. 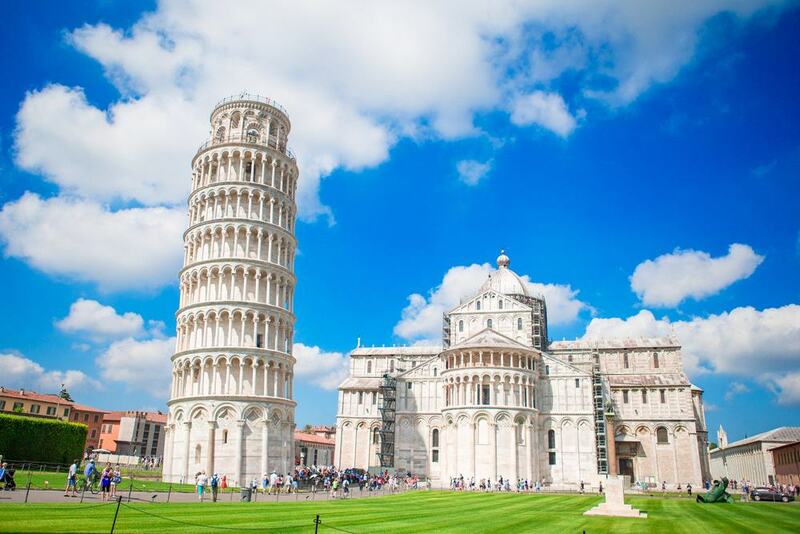 During the 11th century and onwards Pisa rose to prominence and became one of the major maritime republics of Italy. The city saw great development and it grew in population and investment was poured into the city to improve its infrastructure and build its world famous monuments that still stand today. During the Middle Ages Pisa was involved in various battles and played an important role in the wars and feuds between the Guelphs and Ghibellines. Today the city still maintains its ports and this accounts for much of its economy, furthermore, due to iconic buildings such as the Leaning Tower, Pisa has a well-developed tourist infrastructure. 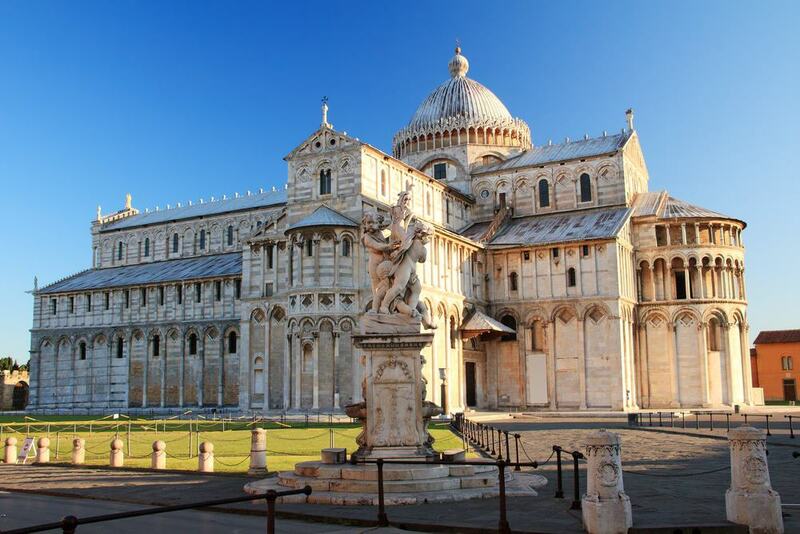 For those wishing to visit Pisa, this city has a fantastic array of beautiful historical buildings and indeed it boasts over 20 historical churches. Furthermore Pisa has some world class museums and beautiful scenery along the banks of the River Arno. This historical city is worth much more than just a fleeting visit and serves as a great base for those wishing to explore this region of Tuscany. This Cathedral is sometimes overshadowed by the leaning tower, but it is a beautiful structure in its own right and is an absolute must when visiting Pisa. Construction on this amazing cathedral was started in the 11th century and it was completed in 1092. The front façade of the cathedral is truly ornate with a series of beautiful stone and marble arches and three opulent bronze doors. Furthermore, the interior of the cathedral is absolutely magnificent – the ceiling of the main aisle is covered with gold decoration and the dome of the basilica has a stunning fresco depicting the Assumption of Mary. This structure truly is a masterpiece of religious construction and is wondrous to behold. This is by en-large the main reason people visit Pisa and is a structure that is known worldwide. The Campanile or bell tower of Pisa Cathedral is a beautiful structure in its own right, but it has been made famous by its noticeable tilt. Constructed in the 12th century after the cathedral, it was soon found that the foundations were unstable and the building began to lean. To this day the tower still leans and measures have been taken to ensure it doesn’t collapse. Aside from posing for funny photos, the architecture of the tower is actually fantastic and the 6 rows of stone arches are simply beautiful. Furthermore, you can climb to the top of the tower for a surreal tilted view of the surrounding city. 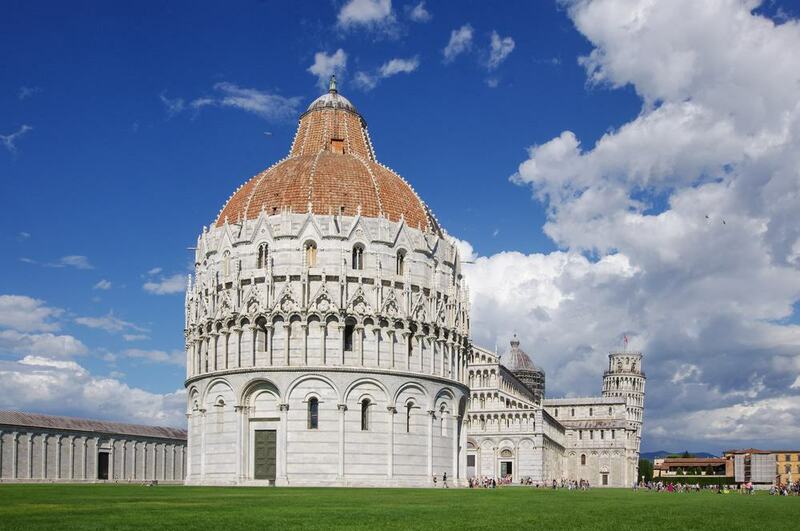 Although located within the Piazza dei Miracoli, the Pisa Baptistery is a worthy attraction in its own right. This structure was created around the same time as the Campanile and was built to replace the old original baptistery. This immense structure stands at 54m high and has a gorgeous exterior design with many different statues, arches and decoration. Furthermore, the domed roof of the baptistery is only half complete – half is covered in orange tiles, whilst the other half remains bare and has never been finished. Inside the baptistery, the opulent decoration continues and you can find a pulpit and a font that are both highly decorated. The final noteworthy structure within the Square of Miracles is the Monumental Cemetery. Located to the side of the Cathedral, this complex is made from the same stone as the other buildings and features a beautiful and peaceful interior courtyard. The interior hallway of the main building is bathed in light and features some beautiful (if not slightly faded) frescos. Possibly the most well-known part of this complex is the courtyard – a large lawn is surrounded by beautiful flowers and the outside walls are lined with ornate arches to create a charming and photogenic scene. Located on the banks of the Arno River, the National Museum of Pisa is the most prized museum in the city and features some stunning artefacts and sculptures. If you are looking to learn a little about the history of this fine city, this museum is the place to visit. Notable objects include original sculptures from the Cathedral and Baptistery and some wonderful paintings dating back to the 12th and 13th centuries. Furthermore, there is also a series of ancient manuscripts and other religious relics from the various churches in Pisa. If you choose to visit a museum during your stay in Pisa, make sure it is this one! 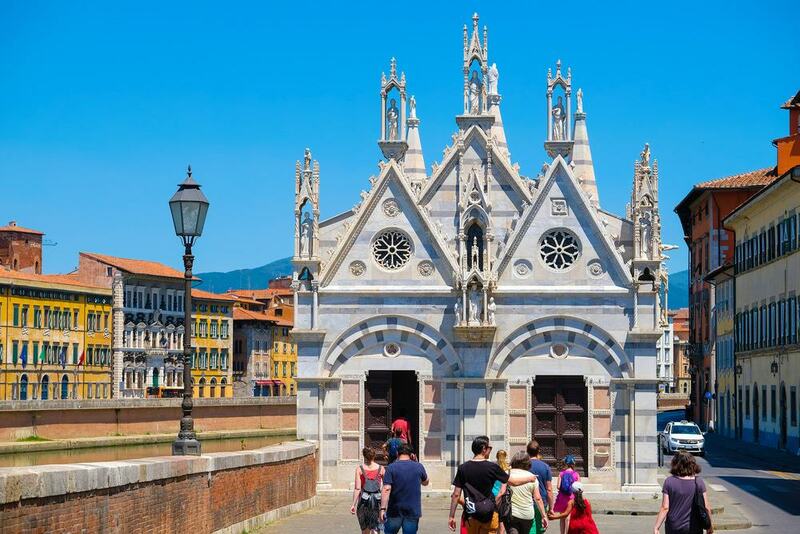 Although this church is really quite small, it is considered one of the most beautiful in Pisa due to its ornate design and riverside location. You can find the Church of Santa Maria della Spina on the left hand bank of the River Arno opposite the National Museum of Pisa. Originally created in the 13th century, the building features a Gothic style with a series of opulent pointed pediments and several rose windows. The interior is quite reserved in comparison and features white and green striped stone walls and a series of sculptures. When walking along the Lungomare, this church is definitely worth a visit. The Knights Square is one of the main squares in Pisa and the Palazzo dei Cavalieri is a beautiful Palace that is the central attraction. This palace was constructed in the 16th century and was originally the HQ of the Knights of St. Stephen. The front façade of this palace is truly beautiful and features some spectacular decoration on the stone work. Furthermore, there is a large central staircase leading up to the main doors and a series of stone statues representing the Dukes of Tuscany. 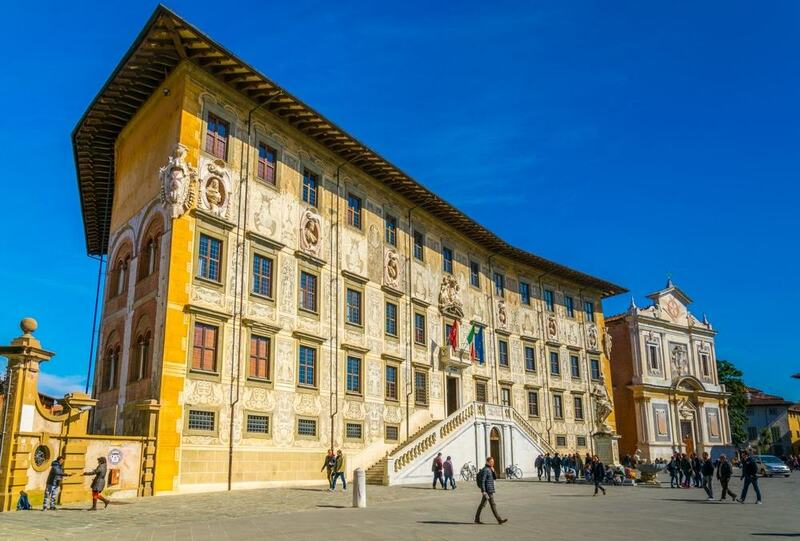 As one of the premier palaces in Pisa, the Palazzo dei Cavalieri and the Knights Square is a must see. The River Arno is one of the main rivers in Italy and Pisa was built around this waterway. This river stretches for 241km and has its source at Mount Falterona. The section of the Arno that runs through Pisa provides a truly beautiful landscape and is an amazing place to simply walk along. Five gorgeous bridges span the Arno in central Pisa and both the Lungarno Mediceo and Galileo Gallilei run parallel to the river. The houses and architecture create a gorgeous backdrop and this part of Pisa is truly photogenic. 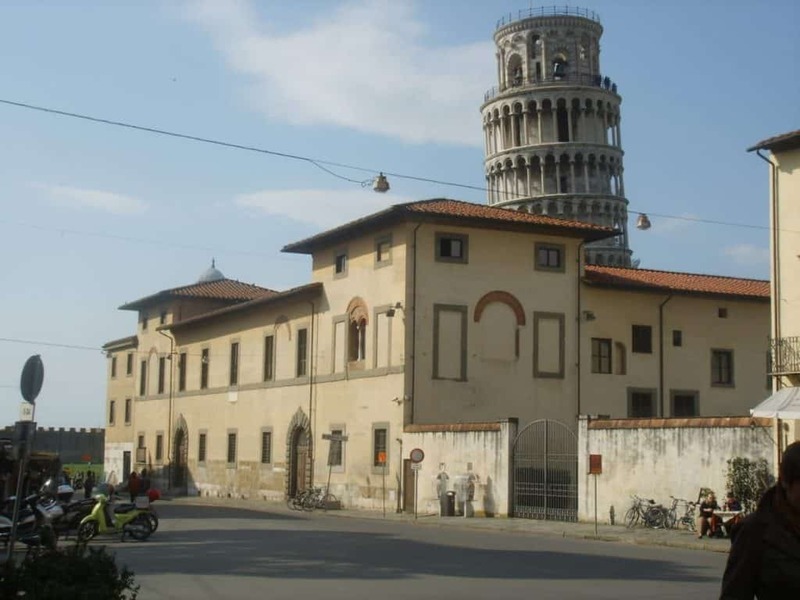 Although this museum has a host of delightful treasures, it is one of the least visited in Pisa! The Cathedral Museum is located in the Piazza dei Miracoli and offers fantastic views of the leaning tower from its second floor windows. 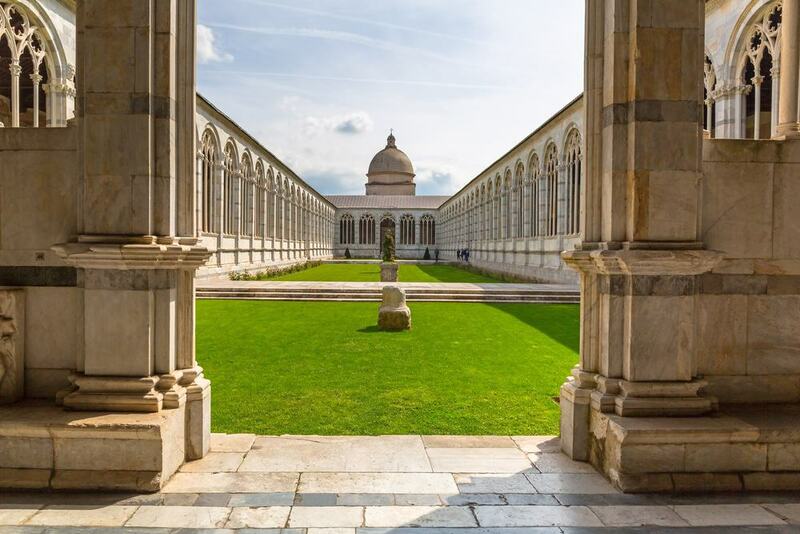 Within this museum you can find a huge collection of artefacts and relics from the Cathedral of Pisa and the surrounding region. Items include embroidery, tombs, sculptures, paintings and silversmith work. Furthermore you can also find a number of relics from Pisa’s naval history and a range of religious findings dating back to Roman times. Each display is beautifully presented and there is an extensive English description. If you are looking for a combination of fantastic architecture and high end retail shopping, the Borgo Stretto is the place to visit! This delightful street is located in the heart of the city and starts at the Piazza Garibaldi next to the Ponte di Mezzo. On this street you can find a range of designer stores, boutique shops and quaint cafes. For those who love a little retail therapy there is no better place in Pisa to visit! For those who aren’t interested in shopping, the beautiful architecture of the buildings is still a must-see attraction. This attractive and eye-catching structure is located on the banks of the Arno River and is part of the old citadel complex. 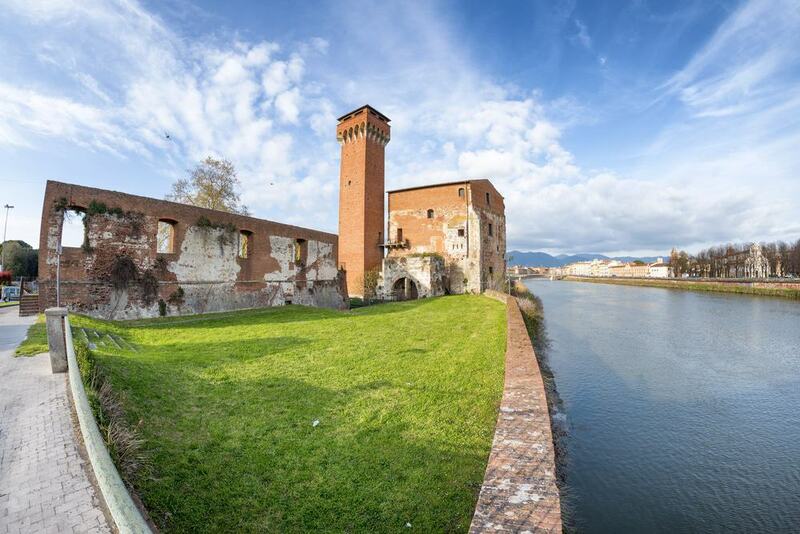 This ancient complex of buildings was once the main ship-building area in Pisa during the 13th and 14th centuries. During the 15th century the tower was constructed however as part of the cities defensive fortifications. In modern times, the tower has been renovated and is now open to the public. Once you are at the top, you are granted with fantastic panoramic views of Pisa – you can see the River Arno in all its glory, and even across to the Leaning tower and Cathedral. Keith Haring is a world renowned artist who is famous for his wall murals. Although Pisa has a host of historical buildings and beautiful Italian architecture, it does feature a beautiful mural by this American artist. 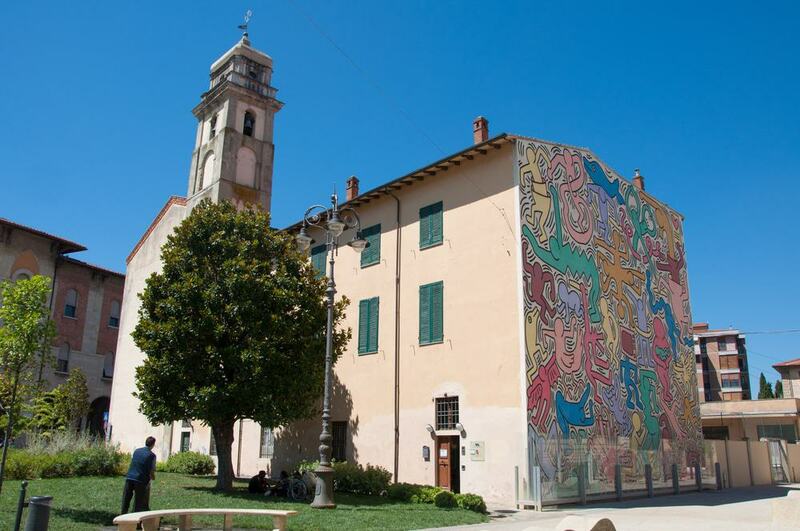 Located just off of the Piazza di Vittoria Emanuele II the mural is a truly magnificent piece of artwork and displays a vision of peace and harmony. Bursting with colour, the mural features 30 different figures in various poses and speaks of life and vitality. For those interested in art, this mural is an absolute must see and it creates a stark contrast to the other buildings in Pisa. This beautiful Botanical Gardens is maintained by Pisa University and is a wonderful place to visit. Originally the garden was constructed in the 16th century by the Medici family and has been relocated several times. Located in the heart of the historic old town this garden is easily accessible and contains a beautiful array of plants, trees, flowers and fauna. The garden is split into several different sections including gardens, ponds, greenhouses and an arboretum. The structures within the botanical gardens are beautiful and the variety of plants is simply gorgeous. 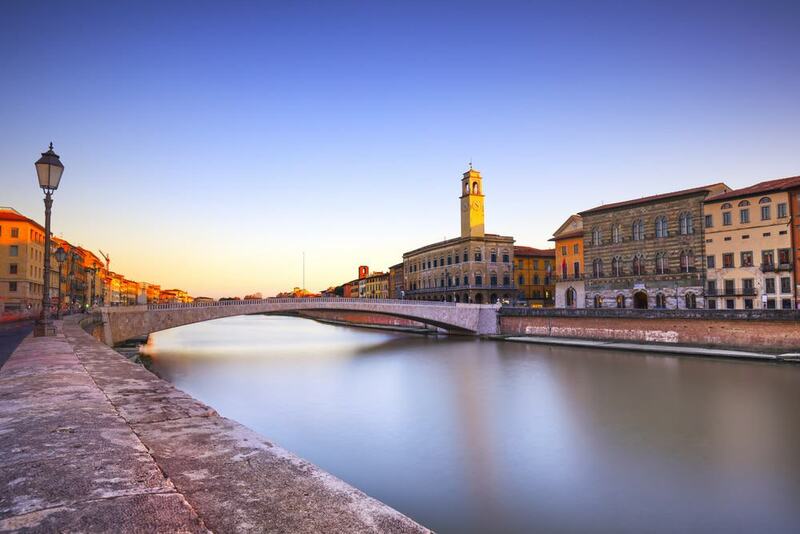 The Mezzo Bridge is one of the most beautiful and prominent bridges in Pisa that spans the River Arno. This bridge is 89m long and was constructed in 1947. White Verona stone has been used to line the sides of the bridge and it was designed by Sergio Aussant from Livorno. If you are looking for a photogenic view of the River Arno – this is the bridge to cross. Both sides of the bridge, the architecture is fantastic and the views are sublime. Italy is famous for its world class Ice cream parlours and Pisa has the Gelateria De Coltelli. This ice cream parlour is known throughout Pisa for its divine organic gelato and wonderful range of gorgeous zesty flavours. Located on the banks of the River Arno, this Gelateria is an absolute must if you wish to try some authentic homemade ice cream. Flavours available include ginger, pine nuts and honey, candied lemon peel and even kiwi fruit.